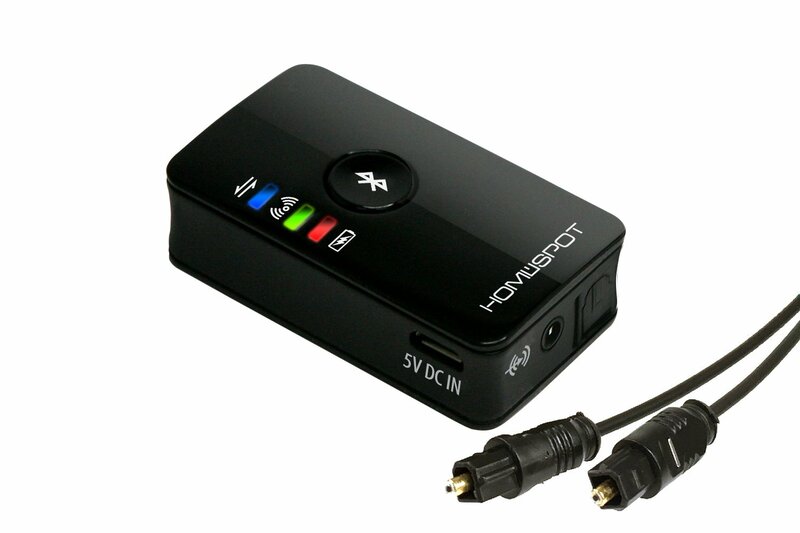 Home › Homespot Dual Stream Optical Digital Wireless Hd Bluetooth Audio Transmitter ..
Connect your bluetooth headphones or speakers to your TVs and other devices with high-quality digital audio to up to two Bluetooth headphones or speakers. Dual Streaming Bluetooth Connectivity Stereo audio streaming to two Bluetooth devices from your TV, Computer / PC, iPod, MP3 / MP4, Car Stereo etc simultaneously Instant Auto-Reconnect to last connected devices Connect your Bluetooth devices to HomeSpot Bluetooth Transmitter with one press of the Bluetooth pairing button and you're ready to listen. From then on, re-pairing is automatic for a hassle-free experience. Digital & Analog Connectivity The Connect offers both analog and digital audio inputs for the widest compatibility with old and new TVs and other devices. Audio sync with video with aptx-enabled device Enjoy high fidelity audio quality and minimized lip sync latency with aptx-enabled device. Packaging Included HomeSpot Bluetooth Transmitter with S/PDIF (Optical) Input 1 x Optical Toslink Audio Cable 1 x 3" 3.5mm audio cable 1 x 3" RCA cable 1 x 3" micro USB cable Instruction manual Demo video : IMPORTANT NOTICE HomeSpot BTADP-128-D only supports PCM audio signals and does not support Dolby AC-3, DTS, or other surround sound signals. Therefore, it is important that the digital audio output of your device defaults to or can be set to PCM/LPCM output. Otherwise the sound output will be noise/static.